The solar eclipse of 8/21/2017 inspired this SUN+MOON rebus puzzle, which creates 4 eclipses (signified in the answer grid and the AL file as the letter E). There’s also the SUN revealer and the internal consistency of all the SUNs going Across and all the MOONs going Down. RUDADUB is an odd answer, but I liked including SNACKBAR and LURCH (my wife is directing the stage musical of “The Addams Family” this fall). The film “Space Balls” was a fave as a kid, though Pizza the Hut grossed me out. I still get a kick out of the part that’s an “Alien” spoof, though (be warned: it’s both a little graphic and very silly). 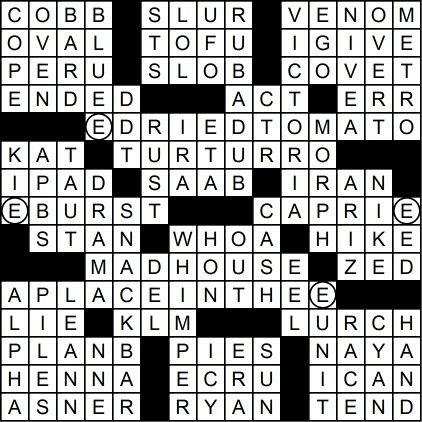 Good day crossword (and solar eclipse) lovers! Well, we’ve all been waiting for the eclipse of 2017 and, during that wait, we hope you got to solve this very clever puzzle which pays homage to the historic event. There are four boxes in the grid that have circles in them, and, if you read those entries that contain a circle going down, it needs to be filled in with “moon.” If you read the entry that includes a circle going across, it needs to be filled in with SUN, which is being “blocked” by the moon in this puzzle (68A: [Light-producing space ball that may be blocked by a smaller-but- closer space ball, creating a phenomenon represented four times in this puzzle’s grid]). A-HA Moment (When I figured out the theme): Seeing the crossing for “blue moon” and “sun-dried tomato,” as well as realizing the events of today were the giveaway. Immediately, I had to go to the other circled entries and filled those in before going on with the rest of the grid. answer (46A: [Sweetie]). With that “u” in place, MADHOUSE became “madhuuse,” which made me chuckle as I pronounced the word I created (49A: [Hectic place]). Sportsball moment of the day: Starting tomorrow, I’ll be spending most of the next three weeks in the Flushing section of Queens while covering the 2017 US Open tennis tournament. On the men’s side, the defending singles champion, STAN Wawrinka of Switzerland, will not be able to defend his crown because of a knee injury. Stan is a three-time major winner; Along with winning last year’s US Open, he won the French Open in 2015 and the Australian Open in 2014. Hope you all had fun observing the eclipse! Have a good rest of your week!